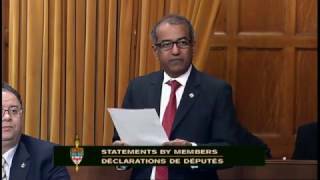 MP Chandra Arya presenting his Private Member's Bill, C-305. Added October 28, 2016 from Chandra Arya. Congratulations to Heather Rose on receiving the Everyday Political Citizen award from Samara Canada. Heather, along with her friend Kim Peterson created the Ontario Special Needs Roadmap for School, which helps parents of children with special needs navigate and understand the programs available to them. Watch me ask VIA Rail Canada CEO, Yves Desjardins-Siciliano about grade crossings in Nepean. Added April 10, 2017 from Chandra Arya. Congratulations to the Ottawa Children's Choir who performed on Sunday, April 9th at the official ceremony marking the 100th anniversary of the Battle of Vimy Ridge. Added July 20, 2017 from Chandra Arya. © 2019 Chandra Arya. All rights reserved.